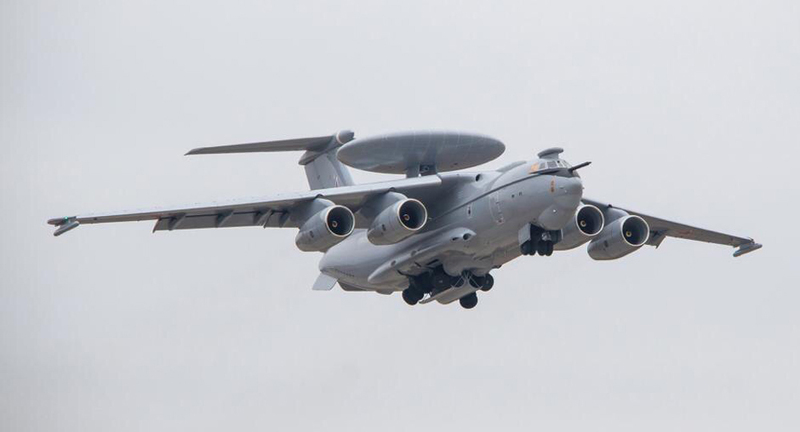 A service-representative prototype of the A-100 next-generation AWACS (airborne warning and control system) made its first flight on February 8 to begin Russian state acceptance trials. Media representatives were not permitted to witness the event, but a few photos of the aircraft in flight were released. The project, sometimes dubbed the Premier, is led by Russian Electronics (Roselectronika), a member of the Rostec state corporation. In a statement dated February 9, the company describes the A-100 as a “multi-functional aviation complex for radio-electronic patrol and guidance”. “During the flight, the crew assessed the aircraft handling qualities, performed avionics checks and tested the aircraft’s automatic control system for proper functioning. The crew was able to assess the aero stiffness [stability] of the flying platform and perform tests pertaining to algorithms of data-exchange between the ground stations and the aircraft”. The statement also included quotes from academician Vladimir Verba, general designer at the Vega Concern, a key member in Russian Electronics responsible for radar development and mission equipment integration. “A new, very important phase in the A-100 testing has just commenced." he said. "This is an aviation system that incorporates most advanced technologies." Verba insisted that the A-100 development has demonstrated that Russia’s current level of science and engineering is “not just similar to that of the world’s leading nations, but surpasses it in a number of key parameters.” Earlier, he said that the A-100 was developed as a direct replacement for the A-50 and its A-50U mid-life upgrade, which currently represents the only AWACS type in Russian service. The statement also made a point that, before the February 8 flight, the aircraft had been painted in standard Russian Air and Space Force (VKS) colors. In turn, the defense ministry provided the following comment: “Development of the A-100 multi-functional aviation complex has been due to the advent of new classes of targets and next-generation fighter aircraft. Its performance significantly surpasses that of both local and foreign designs of the given class”. The A-100 effort involves hundreds of enterprises across the Russian military industrial complex. The A-100 employs the platform of the Ilyushin Il-76MD-90A strategic airlifter, which is now produced at the Aviastar-SP factory in Ulianovsk. That enterprise assembled a “green” aircraft and flight-tested it in 2014 before ferrying it to Taganrog, where TANTK Beriev is based. Also a member of the United Aircraft Corporation (UAC), Beriev—rather than the Ilyushin design house—is responsible for the A-100’s flight performance. After being outfitted with the (non-rotating) circular radome above the fuselage, the A-100 prototype flew for the first time on November 18, 2017, to test handling qualities and airframe stability. At that time, however, the aircraft lacked key items of mission equipment. Because of its configuration, the A-100 bears a resemblance to the A-50 (NATO name: "Mainstay," also produced by Beriev and based on the original Il-76 airframe), but has a larger radome. It houses newly developed antennas along with “a special set of radio technical equipment.” Besides, the A-100 comes with additional antennas all over and inside the airframe. The antenna system employs digital beam scanning and active-phased-array technologies using solid-state transceivers. Reportedly, the main radar operates in two wavebands. Technological advances have enabled a twofold increase in detection ranges against airborne and sea-going targets compared with the A-50, along with an increase in the number of simultaneously tracked targets, and in the speed with which data is processed. Key elements of mission equipment have been undergoing flight-testing since October 2016 in an A-100LL flying laboratory, which was produced by convertin a standard A-50.